Smokey the Bear, the iconic American symbol for forest fire prevention, actually was preceded by an earlier fire prevention strategy. 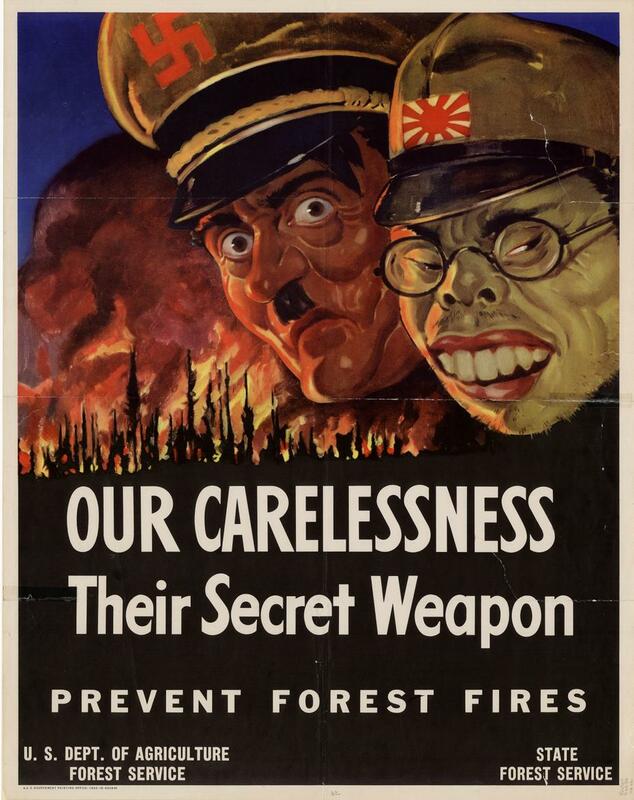 President Franklin D. Roosevelt first started a fire prevention campaign when millions of acres of National Forest were being lost due to careless people. The campaign started with Uncle Sam and took a religious turn before tapping into the war movement. When Japanese planes attacked Pearl Harbor on December 7, 1941, and Japanese submarines fired shells exploding a Santa Barbara, California oil field - the war was brought to American soil. 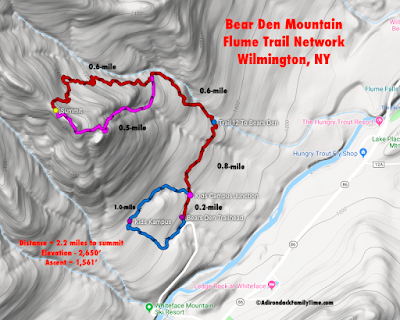 With young men and experienced firefighters enlisted in the war and stationed away from the home front, fear grew that these attacks would continue to destroy lives, property and National Forests. Citizens were encouraged to take a personal interest in fire prevention and organize community prevention efforts. With the success of Disney's 5th animated movie, Bambi, the fire prevention campaign shifts from one of fear to one of sympathy. After Disney loaned its Bambi characters for one year for a fire prevention campaign, the Ad Council, USDA Forest Service and the National Association of State Foresters recognized the need for an animal mascot of their own. In 1944 a cute bear was chosen as the mascot making Smokey Bear a part of the longest running public service ad campaign in US history. The goal was and is to encourage people to be careful. With preventative measures, most fires can be avoided. Fun Fact: Smokey Bear is often called Smokey the Bear, but "the" isn't really part of his name. The "the" was added to the 1952 song written by Steve Nelson and Jack Rollins. 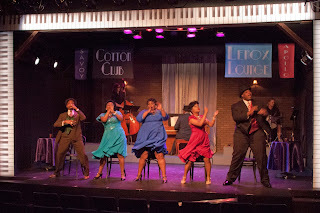 The extra "the" was added to maintain rhythm. 1938 The first fire prevention poster featured Uncle Sam with the slogan"Our Forests - Out Fault"
1939 Education was needed to stop people from tossing cigarettes on the ground and starting fires. " 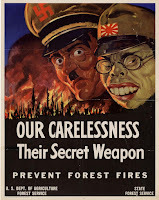 Fire Wrecks A Forest"
1941 Japanese planes attack Pearl Harbor causing concern to citizens and making fire prevention of personal and community interest. 1942: Disney's animated film "Bambi" premiered in New York City, garnering sympathy for forest wildlife when a major forest fire is started by a careless human as part of the movie's plot. 1942 Woody is created by the American Forest Products Industries to help promote the message of the importance of timber products and the forest as a natural resource. 1944 Bambi and other characters are loaned for one year to the US government, appearing in public service announcements and campaigns. 1944 With the success of using Disney's Bambi as a mascot, the Ad Council, USDA Forest Service and the National Association of State Foresters recognize the need for an animal mascot of their own. 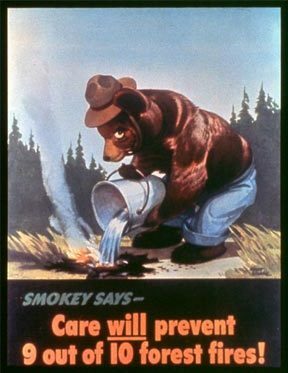 1944 A bear is chosen as the mascot and authorized by the Forest Service with the first poster stating the slogan "Smokey Says - Care will prevent 9 out of 10 Forest Fires"
1947 The slogan is changed to "Remember Only YOU can prevent forest fires!" 1950 A fire tower operator in the Capitan Mountains of New Mexico calls in a wildfire. The crew discovers a bear cub. That cub becomes a living representation of the mascot Smokey Bear. That Smokey lives for 26 years at the National Zoo in Washington DC and becomes a living symbol for forest fire prevention. 1984 Smokey is the first individual animal to ever be displayed on a postage stamp. .2001 The slogan is updated "Only YOU can prevent forest fires!" Fun Fact: Smokey Bear is the only other "celebrity" besides the President of the United States with his own zip code.